One of the first announcements made by the majority Conservative government on coming to power in the UK in May 2015 was in relation to proposed legislation on trade unions. The newly appointed Business Secretary Sajid Javid stated on the BBC Today Programme that ‘We've already made clear, in terms of strike laws, that there will be some significant changes... it will be a priority of ours. We need to update our strike laws. We've never hidden away the changes we want to make. I think it's essential to make these changes’ (BBC News 2015). 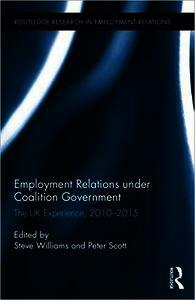 At first sight, this might suggest that the return to a Conservative majority government signalled a significant change in the way relationships were to be structured with trade unions, reflective of the significant legislative attacks on trade unions under the Thatcher and Major Conservative administrations of the 1980s and 1990s.